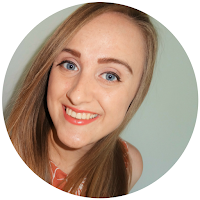 Ever since my 1L year, I decided that I was going to be really vulnerable on this blog, which means sharing both the highlights and the low points of my law school journey. This really became important to me when I started sharing my mental health struggles that became especially apparent during my 1L year. This is because that I started this blog to help other law students and guide them through the struggles that law school entails. Although I haven't been great about posting, this last year has been full of many ups and downs and it's time I share them without you. So without further ado, I want to tell you guys about the absolute worst thing that happened to me during 2018 - I didn't get my dream job. But don't worry, it's going to be okay. First thing's first, let's back it up a little bit. Ever since I began law school, I knew that I was absolutely made for law firm life. I could just see myself putting on a suit every day, riding the elevator to the top of a high rise, and eventually securing a corner office where I'd spend my days. And that dream started to become a reality when I got my 1L summer internship, at a prestigious law firm from my hometown. It was everything I dreamed of. Not only did I do fulfilling work, but I loved the attorneys I worked for and could truly see myself working at that firm forever. So you might imagine how excited I was to be invited back to intern at the same firm my 2L summer. I accepted right away, and looked forward to it for the entirety of 2L year. One of the partners had told me that I had "passed their test" and as long as I didn't mess anything up, he saw me getting a post-grad job offer. Fast forward to 2L summer and I have another amazing summer. I receive completely positive feedback on all my work. Things were falling into place, and I was so happy. Then, on the last day of my internship, I walked into my final review with one of the partners. Again, we went over all of my projects where I received positive feedback and told wonderful things. And then the bad news came. They didn't have any positions available for me next year - they only needed litigators, and I had indicated pretty strongly that I was only interested in transactional work. And this news had come to the hiring committee fairly late in the summer, meaning it came as a shock to everyone in the office. I was, of course, absolutely devastated. But I thanked my boss, and said goodbye with a smile. And then I ran to my office where I cried. And I don't mean like one tear just rolled down my cheek. I was sobbing to the point where I couldn't breathe. I cried to two of the younger associates that had been my friends. I was so embarrassed, but it was basically a panic attack because my entire plan had unraveled. So I gathered my belongings and left my dream job behind. I'm not going to lie, this still stings a little bit. Even writing this post right now, I am getting teary eyed. I desperately wanted to be mad at everyone I worked with for giving me false hope. But the truth is, I wasn't mad at all. I was completely and totally heartbroken because I truly wanted to work there with my entire heart. To be totally and completely honest, I still want to work there in my heart. But that isn't the opportunity that is available to me, and I have no choice but to figure it out. Luckily, now it's five months later, and I know I was able to recover well (more about that later), but at the time all I wanted to do was sob on the couch and eat ice cream. 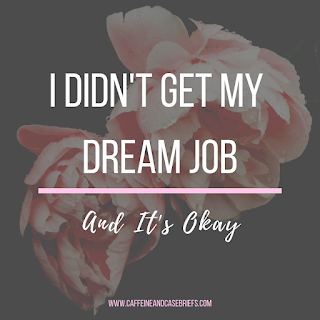 But that wasn't a possibility - I had to start looking for a post-grad job, update my resume, sharpen my interview skills, and most importantly, find a new dream to motivate me. To be honest, I have never been someone who deals with failure well. And that's exactly what this felt like to me - complete, and utter failure. Now reflecting back, I can see that this was not the case. I did the opposite of failing. I excelled at my internship, receiving completely positive feedback and making strong connections with professionals in the community. Although my hope was to receive a full-time offer, this taught me to adapt to big changes and figure them out. This experience taught me a lot of things. First, it taught me that my plan might not always work out, but even when it doesn't, I can adapt to the hardships and figure them out. This experience helped me brush up on my job search skills. This experience taught me to value the opportunities that I have had and how they can help me in the future. This experience taught me that disappointment isn't the end of the world. And this experience taught me that even something that feels like failure can't break me like I thought I could. 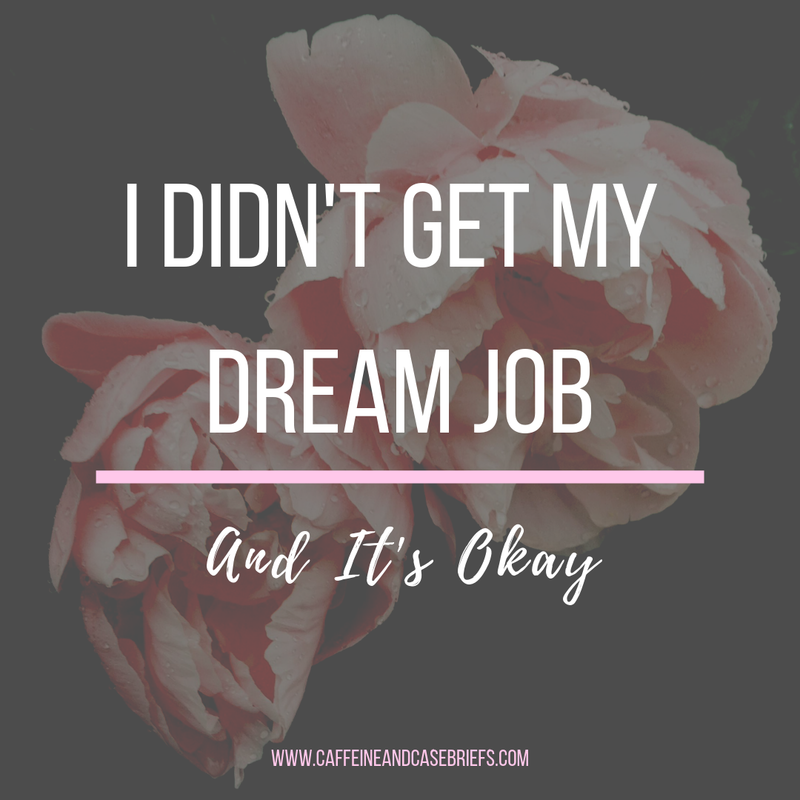 But most of all, this experienced affirmed that I am taking the right steps toward my goals and that my long-term goals, hopes, and dreams mean something to me. Like many law students, I think that I have had times where I wondered if I was on the right path, or doing the right thing by being in law school. However, after having such an emotional reaction to not getting this job, I realized that I am completely and totally on track. I'm somebody that doesn't consider myself to be emotional, so for this to devastate me so much means that becoming a lawyer at a firm I love is so important to me. This experience only made me want to fight for that dream more. So overall, I didn't get my dream job. Yet. And that's okay.